» What an amazing day! 150 people all playing games in this beautiful space! 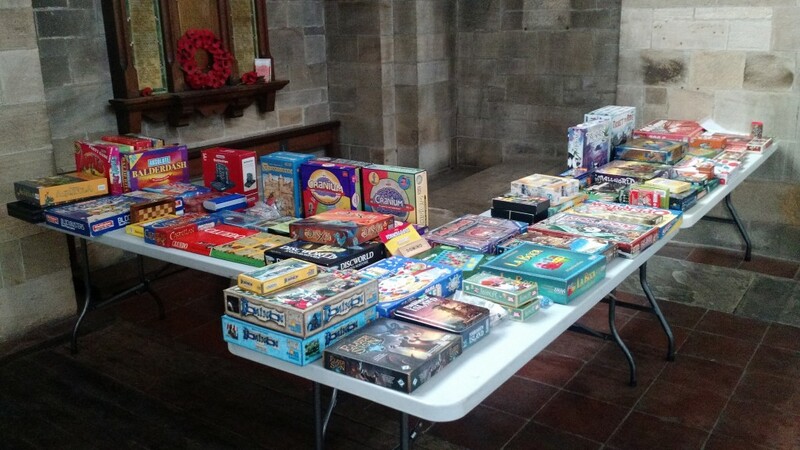 Wow – who knew board games in Leeds were so popular? Over 150 of you came along to Left Bank to play all manner of games at this amazing event. We want to thank every one of you who attended – young and old, some of you die-hard gamers and many of you playing modern games for the first time. The atmosphere was so relaxed and happy the whole day… perhaps a sign of how awesome a good board game is. Congratulations to our raffle winners! Thanks to Esdevium Games for providing the prizes, and for teaching games at their tables all day. Thanks also to Steve Jackson Games for bringing the pre-release of Munchkin Steampunk and for teaching it all day. It goes without saying that we’re eternally grateful to Left Bank Leeds for providing the space, the drinks and support all day, and to Manjit’s Kitchen for the great food. And of course we couldn’t have done this without all our amazing volunteers, not just the people teaching games but also everyone who helped with the door, the badges, making people feel welcome and clearing away at the end. We couldn’t have done it without you! Thanks Andreas, Andrew, Bev, Edward, George, Jacko, Jordan, Luke, Sue, Tom and Vincenzo! So many games to play, and so many people to play them! I’m sure loads of you are itching to play board games again as soon as possible! The good news is that there are loads of board games groups in Leeds. Check out our two closest groups, Leeds Gaming (meets at The Victoria and at Lamb & Flag, twice a month) and Leeds Meeples (meets at Wharf Chambers, about once a month), and this list of all the other groups that meet nearby. If you’ve got any feedback about the day or any amazing photos of games you played, please share it with us on Facebook, on Twitter or by emailing us at [email protected]. Hope to see you at one of our other events soon!